Hi, I'm Annemarie. Growing up my mom called me Annabelle, which is how I got the name for my business. I've been struggling for awhile now with how to describe myself on this site. It's easy to talk about my family or my career, but not myself. I'm a wife and mother, a Christian, and a typical type A personality. I love to cook. I hate to exercise. I spend most of my time with my girls and fixing up my house. When I do find some spare time, I like to read, scrapbook, and play around in photoshop (dorky, I know). I LOVE taking pictures. If I forget to take my camera somewhere, I go into a panic. People know me as the lady who always has a camera. Taking pictures makes me happy...very, very happy. I was married in 2002. My husband ("the man") is a computer guy, an avid soccer fan (and sometimes player) and my best friend. My oldest daughter ("bug") was born in 2007 after several years of infertility. She's our miracle baby and a handful. But she's gorgeous, brilliant, has an amazing imagination, and loves to read and do crafts just like her mommy. Our second ("monkey") was born in 2009. Her personality is nothing like her sister's. She's my easy child. She's always happy and loves all things girly. She's got a quick temper, but she's also quick to say "I love you" and loves to cuddle. She thinks she's the same age as her big sister, and people often mistake her for being at least a year older than she is. Our family moves a lot. The man and I are on our fourth house in just nine years. I'm not sure if we're just unsettled or if moving and home improvement are some sort of strange addiction. I seriously don't understand what other people do all weekend. I'm sure the rest of the world doesn't spend their free time painting and tiling, but I'd be bored without it. I do stress about all of the work I need to do and about living in a construction zone rather than a nice, calm house, but each time we finish a house, we always move on. Our current home was a bank owned property. It has good bones, but cosmetically we've had to change just about everything. 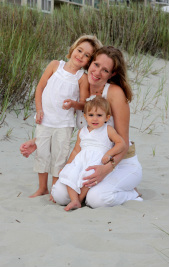 Before I had my girls and left my career to be a stay at home mom, I was an urban planner. When I would tell people that's what I did, they would typically look confused. No one knows what an urban planner does. When I would explain, they would usually respond with something like "that sounds interesting". I think they were being polite, because it's not really that interesting. It was, however, very stressful and involved a lot of late nights away from home. And that's why I decided to turn my passion for photography into my work. I can set my hours, do what I love, and therefore be a much happier wife and mommy.